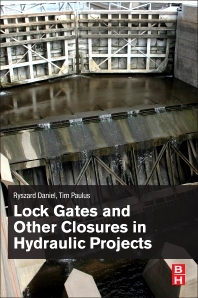 Lock Gates and Other Closures in Hydraulic Projects shares the authors practical experience in design, engineering, management and other relevant aspects with regard to hydraulic gate projects. This valuable reference on the design, construction, operation and maintenance of navigation lock gates, movable closures of weirs, flood barriers, and gates for harbor and shipyard docks provides systematic coverage on all structural types of hydraulic gates, the selection of gate types, and their advantages and disadvantages. The discussion includes the latest views in new domains, such as environmental impact of hydraulic gate projects, sustainability assessments, relation with the issues of global climate change, handling accidents and calamities, and the bases of asset management. Heavily illustrated, this reference provides a generous amount of case studies based on the author’s own and their colleagues’ experiences from recent projects in Europe, America and other continents. Ryszard A. Daniel, PhD., PE, senior consultant and design leader of Rijkswaterstaat (NL), recently retired and founder of a consulting company, is a designer, construction supervisor, project leader and reviewer of infrastructure projects, largely hydraulic, in The Netherlands and other countries. Timothy M. Paulus, PE, senior mechanical engineer for US Army Corps of Engineers, St. Paul District, is a senior consultant, supervisor, project leader and reviewer of hydraulic projects in the USA and other countries.